Graduation balloons on a remote barrier island of Virginia’s eastern shore. This may be something you’ve never thought about: the second you let go of a helium filled balloon, you have littered. You may have never intentionally littered before and would never dream of doing so, but releasing balloons = littering. With graduation season approaching, this is a reminder to all kids and parents that if you must use balloons for celebration, be sure they are secured and disposed of properly. Actually, don’t even put helium in them! Fill them with air and attach them to a stick, no chance of escape. My work in marine debris includes monthly surveys of remote beaches throughout Virginia and twice a year surveys of even more remote beaches specifically documenting balloon litter. 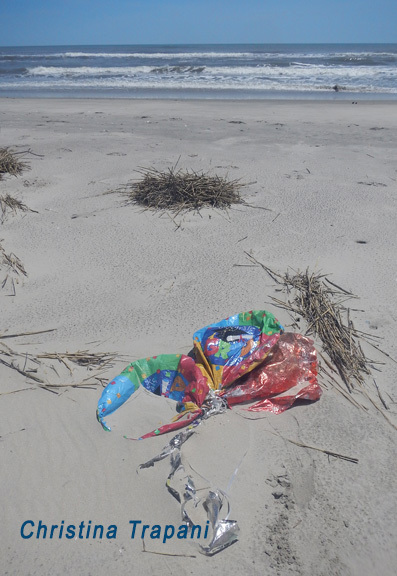 Balloons usually make the top three marine debris items found. In fact, here we are in May, and we are STILL finding Valentine’s Day balloons. After all, on a remote beach, how many people are around to pick them up? And the main theme of balloons found in June and July? GRADUATION! Stop, please, just stop! A burst latex balloon looking a lot like a jelly fish. The balloon industry tells people that it’s okay to release a fully inflated, biodegradable latex balloon with no attachments. In some cases, it will just float up to an altitude where it bursts and becomes nothing more than tiny little bits of latex that will fall to the ground then biodegrade. That may be true, in some cases, but not all. A burst latex balloon often comes back to earth looking like that photo to the right. Kind of looks like a jellyfish, wouldn’t you agree? And biodegradable does not mean edible, digestible or okay to litter. Would you feel comfortable throwing a biodegradable latex balloon, glove or condom out of your car window? I doubt it. 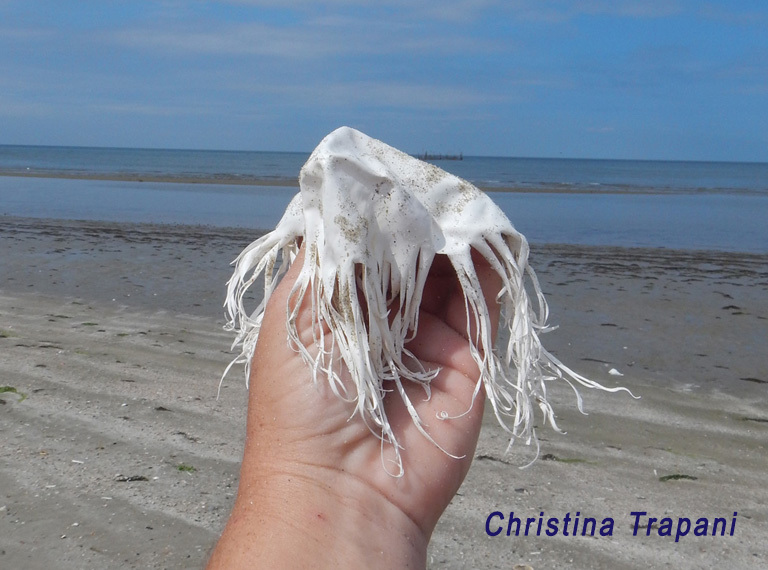 A singing balloon found on Fisherman Island, a shore bird sanctuary. As for the foil balloons (mylar)? They are plastic! And they are getting bigger and bigger and some of them are even equipped with a polystyrene insert that allows the balloon to play music! And like all other plastics, after exposure to the elements, they begin to break apart, flaking off tiny bits of plastic to persist in the environment for years to come. California has made it illegal to sell foil balloons without a weight attached or to release foil balloons because they get caught on power lines and cause power outages! Now you know, if you didn’t know already, that this is a problem. So what is being done? Actually, quite a bit in Virginia. Virginia has developed a Marine Debris Reduction Plan, citing mass balloon releases as a top priority. The Virginia Coastal Zone Management program and Clean Virginia Waterways are currently working on a balloon social marketing campaign which aims to educate Virginians about the dangers of balloon releases. 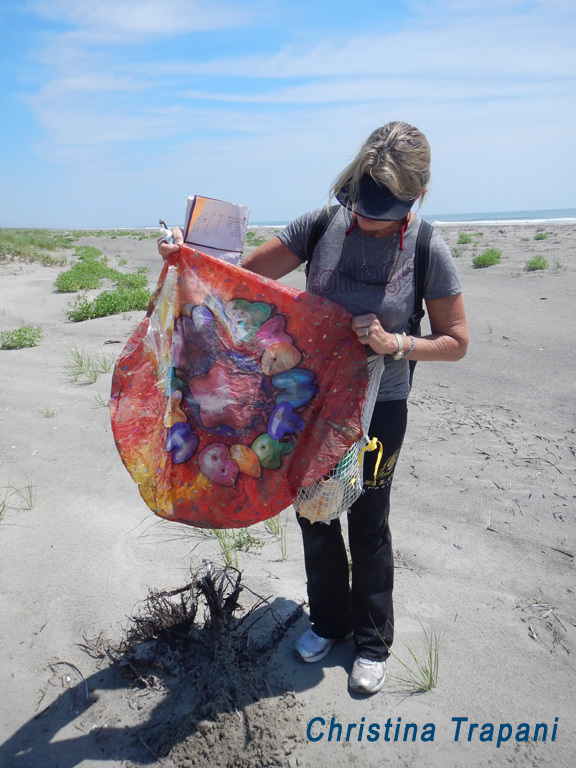 Yours truly, along with researcher Kathy O’Hara and many volunteers, have been documenting balloon litter on remote beaches, going on four years now. Clean Virginia Waterways has a reporting website for Virginians to document balloon litter that they find. www.VirginiaBalloonStudy.org. While legislation was introduced two years ago, it became clear that more education is needed before another attempt. Currently, there is a law in Virginia that makes it illegal to release more than 49 balloons. Balloon releases are usually held for very emotional events. If you are going to try to stop a balloon release, be prepared to offer an alternative. Have a great balloon release alternative? Please let me know: rapcoordinator@vb.surfrider.org. Best thing you can do? Spread the word! Share this post, tell your friends, and of course, never release balloons.